Does Putin have something on Trump? U.S. President Donald Trump and Russian President Vladimir Putin answer questions about the 2016 U.S Election collusion during a joint press conference after their summit on 16 July 2018 in Helsinki, Finland. Amid fallout over President Trump's performance in Helsinki, the idea of so-called kompromat is feeling increasingly likely to many, writes Jon Queally. HOW TO EXPLAIN such behaviour? That has become the question for nearly everyone perplexed by President Donald Trump's bizarre performance at Monday's joint press conference with Russian President Vladimir Putin. And when put to Senator Jeff Merkley directly this week – "Do you think Putin has something on Trump?" – the Senator responded calmly and simply: "I think it's likely. Yeah." With a follow-up question in the interview, Buzzfeed's Ben Smith wanted to know if it could actually be the "pee tape" — a reference to an unconfirmed and salacious detail included in the so-called "Steele Dossier". To that specific question, Merkley once again responded calmly: "Something close to that. Something close to that."
. @BuzzFeedBen: "Do you think Vladimir Putin has anything on him? "@SenJeffMerkley: "I think it's likely." Smith: "Your view is that the pee tape is real?" Merkley: "Something close to that. Something close to that." There was a time there when the Steele dossier's alleged, lewd tape of Donald Trump in a Moscow hotel room was "Something We Didn't Talk About". Then James B. Comey made it not-so-taboo. 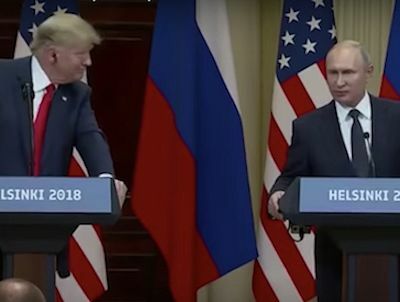 Writing for The Week, columnist Ryan Cooper says Trump's performance in Helsinki has made it increasingly hard to locate any reasonable explanation for Trump's behaviour and rhetoric when it comes to Russia — specifically towards Putin. Despite the fact that much of the rest of the American security apparatus is still bitterly hostile to Russia – and the rest of the Government has not taken many concrete pro-Russian actions – it is simply beyond question that Trump is really deferential to the Russian President. It could be blackmail, it could be ideological alignment, it could be payback for helping win the election, or it could just be the fact that Trump has had a giant crush on Putin for years and years (or some combination thereof). I suspect this is largely why Trump is being so disruptive towards NATO and the European Union — the latter of which he called a "foe" before the summit. No matter how you cut it, he added, this deference of Trump toward Putin is 'a terrible development' for numerous reasons. NEW: Pres. Trump says he misspoke at yesterday's joint presser with Vladimir Putin, meant to say there was no reason "it wouldn't be Russia" behind election meddling. Could it be financial? On Tuesday, new demands went up for Trump to release his tax returns, a call that even some Republican lawmakers have joined. Strikingly, when Putin was asked rather directly if his Government had any incriminating dirt on Trump, the Russian President gave an elaborate answer but ultimately did not deny it. "It sounds like it's utter nonsense," Putin said of the idea that Russian operatives collected blackmail material from Trump's hotel room while he was in Moscow years ago. This story was originally published on Common Dreams under the title, 'Does Putin Actually Have Something on Trump? U.S. Senator Jeff Merkley: "I Think It's Likely. Yeah. "​' ​​​​​​and has been republished under a Creative Commons licence.